Pattern, color, scale, and repetition are important aspects when considering a wallpaper design for one’s home. The large, dark-red, asymmetrical medallions, set within light pink vining foliage unintentionally form a design of diamond shapes across the paper. Smaller foliate medallions in lighter shades of pink recede, while the darker larger medallions seem to move forward. The large and small medallions enclosed by meandering vines create vertical, horizontal, and diagonal movement throughout the design. This colorful red wallpaper by the William Campbell Wall Paper Company exemplifies all the characteristics of a stylish and beautiful wallpaper design as well as having an additional and desirable feature invisible to the naked eye. Embedded within the paint is an ‘antiseptic’ which claimed to make this wallpaper resistant to germs, bacteria, and disease. In the early twentieth century health and hygiene were a primary concern for Americans and some medical experts considered wallpaper to be unsanitary and harbingers of disease as they were printed with water-soluble pigments and couldn’t be cleaned. Having the latest styles and most up to date designs in interior decoration were paramount, but so was maintaining a clean and healthy home. Unlike traditional sanitary papers which were printed with oil-based colors and were unpopular with some design critics for their muted colors and stippled-effect designs, the William Campbell ‘antiseptic’ papers were printed with water-based pigments maintaining their fine artistic details. Sanitary papers were widely used in the areas of a home which would tend to get a great deal of activity. 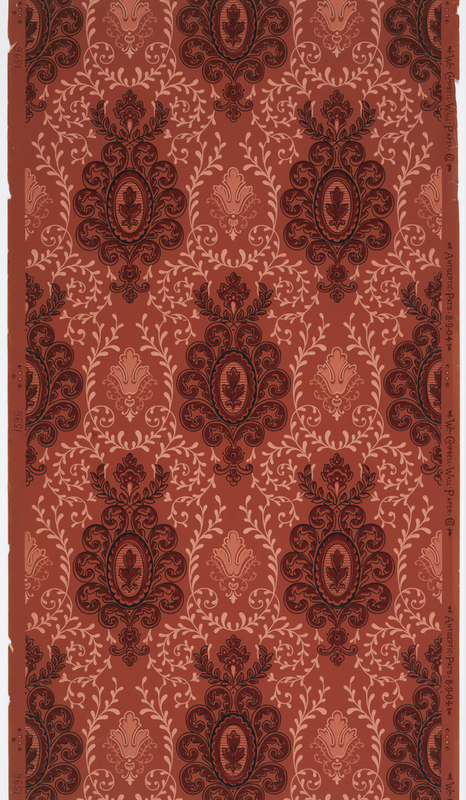 This red wallpaper is an example of a sanitary that would have been suitable for a hall, parlor, or dining room. The selection of wallpaper designs and styles available to consumers in the early twentieth century was overwhelming and the choices seemed endless. However, it was the unique quality of the ‘antiseptic’ in this fairly typical red wallpaper, that sets this William Campbell wallpaper apart from the rest. Rebecca Stramiello is a graduate student in the History of Design and Curatorial Studies program offered jointly by the Parsons School of Design and the Cooper Hewitt Smithsonian Design Museum. This one might have claimed to have been good for consumer health, but what about the green Victorian wallpapers that were printed using arsenic?!?! Buyer beware … and that still applies to housewares today.